Shocking surprise at 95 metre chimney stack? Home > Uncategorized > Shocking surprise at 95 metre chimney stack? Members of the No Incinerator 4 Horsham (Ni4H) Community Group travelled to Swindon, to sit in for several days on the Public Inquiry into the Keypoint Incinerator. This proved an extremely useful experience in light of the anticipated Public Inquiry into the proposed Horsham Incinerator. On the first day, the Public Gallery was packed with members of the public keen to make their voices heard, concerned about the thousands of tonnes of rubbish from London, which could be shipped into Swindon if the controversial incinerator gets the go ahead. Rolton Kilbride on behalf of Legal and General is attempting to overturn Swindon Borough Council’s decision to refuse permission to build an incinerator at Keypoint in South Marston. Horsham District Council is looking forward to working with Legal & General, which has taken over the North Horsham development from Liberty Property Trust. A spokesperson from Ni4H said: “Legal & General has just announced it will be taking over the North Horsham development from Liberty Property Trust – we very much hope that it will also take over Liberty’s stance in robustly objecting to the proposed Horsham Incinerator”. 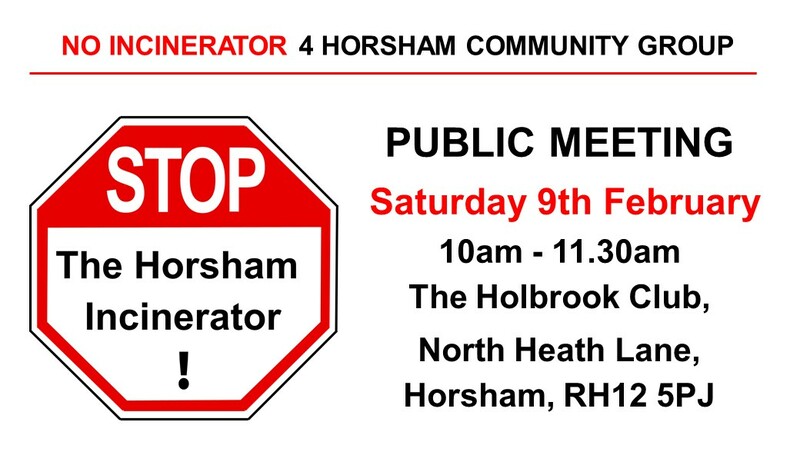 No Incinerator 4 Horsham Community Group is organising a Public Meeting on Saturday 9th February 10am – 11.30am at The Holbrook Club, North Heath Lane, Horsham RH12 5PJ, to enable the Public to find out more about how this proposal would affect West Sussex and beyond with an expert panel, live Questions and Answers. If you did not write at application stage, or you did write and now have something new to say, or wish to modify/withdraw your previous representation, you must do so by 25 February 2019 (quoting APP/P3800/W/18/3218965). Post: Helen Skinner, The Planning Inspectorate, Room 3/J, Temple Quay House, 2 The Square, Bristol BS1 6PN. Include your: name and address, appeal reference APP/P3800/W/18/3218965 and site address: Former Wealden Brickworks, Langhurstwood Road, Horsham RH12 4QD. Previous comments sent about the planning application will be fully considered by the inspector. The appeal documents are available on West Sussex County Council’s online planning register (reference WSCC/015/18/NH) and are also available for inspection at County Hall in Chichester. Ni4H urgently requires legal advice, consultancy reports by recognised experts, and a barrister, who can explain and present the case for concerned residents, to the Planning Inspector at the Public Inquiry with authority. Donations to Ni4H can be made via bank transfer: Sort Code: 20-42-58, Account Number: 63387127 (contact Ni4H to donate by cheque). It’s a valley, pollution sits here, it does not need any more.